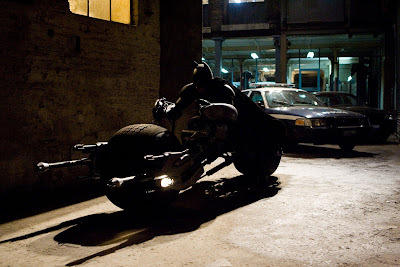 While watching the movie The Dark Knight this week-end, apart from the awe of the movie, one thing which instantly caught my attention, was the bike(or the BatPod) that Batman was riding. So, did some googling about it and here's what I found. The bike was designed by Nathan Crowley who designed the Tumbler Batmobile in the Batman Begins. The bike is basically a ejectable unit of the Tumbler only, which would enable Batman to continue his persuit if the Tumbler gets wrecked. On ejection of the BatPod, the Tumbler would self-destruct itself. Since the BatPod is a ejectable unit of the Tumbler, the Pod shares the Tumber's 20" front and rear tires. Another speciality of the bike is that, instead of being manuvered by hands, the Pod is manuvered by the shoulders, that means no turning, only bending left and right, a complete skeedy, drift like U turns. Instead of having the engine as a singly constructed unit, the Pod has engines located in the hubs of the wheels probably for creating more room for the heavy armor assembly of the bike. In order to provide more stability to the Pods during sharp turns and other manuvers, the wheels have been gifted with an additional pitching motion seemlessly going with it's normal rolling motion. In order to protect Batman's hands, the bike equipped with additional shields. Quite an impressive assembly and a wonderfull design and one of the best looking BatPods ever. Is it really a working model, with an engine..?? yup, you'll se the same bike in spectacular motion in the movie ;)! !